In 2015 single mum Sushila Devi was struggling to make ends meet and didn't even have the money to send her three kids to school. 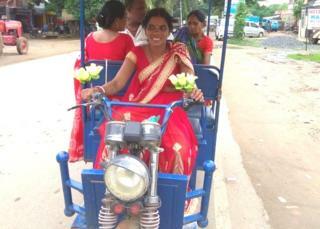 With a loan from a local charity, she bought an e-rickshaw - a type of taxi powered by a three-wheeled electric scooter - and started carrying passengers in her hometown of Bodh Gaya. Now, she earns 10,000 to 12,000 rupees a month (£110-£135; $145-$175) and 20,000 rupees in peak season - enough to send her two oldest children to a nearby school, she says. Firstly, they cost just 38,000 rupees to run per year - "about half as much as running an older petrol-powered rickshaw", he says. They're also popular with regulators. Bodh Gaya now only allows e-rickshaws, not their more polluting cousins, within 5km of the town's ornate temples. "We're about to cross four million electric vehicles on the road globally some time in August," says Colin McKerracher, head of advanced transport at Bloomberg New Energy Finance. Of course, that's only a sliver of the total number of vehicles on the road, but it's steeply up from just 500,000 in 2014. He expects even more growth by the mid-2020s, when electric vehicles "will cost the same as ones powered by internal combustion engines", posing a huge challenge to petrol vehicles. In the meantime, government subsidies are helping to bring down the costs. For example, China - which accounts for half of global electric auto sales - has exempted electric vehicles from purchase taxes since 2014. His is one of a number of firms working on building larger capacity batteries than today's lithium ion ones. Using more lithium "much increases" battery capacity, he says, but it also makes batteries less stable posing a fire risk. Instead, researchers like him are trying to replace this liquid electrolyte with solid materials such as silicon, to make safer "solid state" batteries that hold more charge. Meanwhile, prices for a rechargeable lithium ion battery fell below $200 per kilowatt-hour this year for the first time, says Sarwant Singh, head of the transport team at consultancy Frost & Sullivan. That's down from $750 in 2010. "The forecast is they'll fall below $100 in the next five years," says Mr Singh. "[Then] they become really attractive, and below $80, you're really killing the gasoline engine." In the range they permit, today's electric car batteries are "much closer to what we know from a petrol engine", says Nicolas Griebner, head of product at Mini UK. "We're not there yet, no question, but we are a lot closer than we used to be," he says. There is now an electric-powered car racing championship - Formula E - where 10 teams from around the world compete. In its first four years, "drivers raced for 50 minutes, and halfway through the race had to get out of one car and jump into another," says Formula E spokesman Sam Mallinson. But new, bigger batteries mean from next season they won't need to. Formula 1 vehicles still travel at much faster speeds reaching 240mph. However, the next generation of Formula E cars could travel as fast as 186mph, say experts - up from about 140mph currently. There are also new design possibilities with electric cars, because their engines take up less space, says Mark Preston, head of China's Techeetah Formula E Team. "[When designing] an electric car from scratch, you do the architecture differently than if you were basing your vehicle on an internal combustion car," he says. Byton spokesman Oliver Strohbach says the "very big" screen and better connectivity will let drivers hold digital meetings while they are stuck in road traffic, and have "something meaningful" to do while commuting. Like other Chinese electric car companies - Nio and SF Motors being examples - it is positioning itself to be a key player in what it believes will be a huge global market. "Everyone is basically starting from the same line in this competition, and China sees this as an opportunity," says Dr Xinyu Chen, a Harvard academic who studies energy and pollution in China. However, the electric vehicle market faces barriers to growth. One is that while charging stations have improved - the newest can charge a car to 80% in 10 to 15 minutes - there are cripplingly few of them. China has 215,000 charging stations and poles, the most of any country, but it's a fraction of its target of 4.8 million by 2020. India has 350, compared to the estimated 800 to 1,000 the Delhi region alone could require. Similarly, few countries' energy grids are prepared for a scenario in which millions of citizens recharge their car batteries at peak times, such as in the early evening or at weekends. Solving such problems will require investment, but there are questions over who should pay. "The model of who will build, own, and operate charging stations - carmakers or oil companies - remains unclear," says Dr Chen. None of this worries Ms Devi much over in Bodh Gaya. She will soon have to pay her third child's school fees so plans to expand her business. She says she wants to save enough money to buy another e-rickshaw and rent it to other drivers, so she can make the money she needs.